Older generations have always been weary of new technology, and they may be on to something. Most parents are annoyed when their children constantly stare at their phones, and now they have a reason to be so. As it turns out, there are real health consequences for spending too much time on a cell phone. Sarah Atchison lives in Littleton, Colorado. She is like any other 14-year-old girl in that she loves to look at her phone. From Facebook to Instagram, there is always something to do on the little device. The problem arises when a person spends too much time staring down at an electronic device, such as a cell phone. 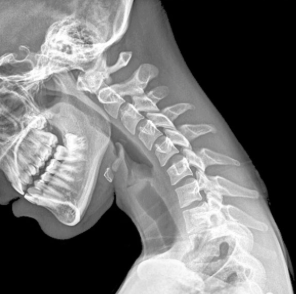 Doctors x-rayed Sarah’s neck, and they actually found that she had a reverse curve in her spine. Now the young girl will have to work to repair years of damage. The problem has caused the young girl to feel bodily aches and pains as if she were an elderly person. “I always look down at my phone,” Sarah admitted to The Now. Were the texts really worth it? Sarah is meeting with a chiropractor to see how she can regain full functionality in her neck. She spent years of her life creating this health issue, and it will take a long time before she is able to feel the way that she was meant to. Luckily for all of us, prevention of “text neck” is pretty simple. It mainly involves living life outside your phone. Spine Health recommends holding cell phones and other electronic devices at eye level as much as possible. This will prevent your neck from being held in a curve in the first place. Taking frequent technology breaks is also a good idea. Getting up and stretching every 20 or 30 minutes will do wonders for your mind and body. In addition to freeing yourself from the stresses of technology, you will get your blood flowing again and even feel more grounded. If you must spend long periods of time staring at a screen, try to keep it squarely in front of you. Leaning to the left or right – even slightly – can take a serious toll after a while. Sarah’s story is a real eye-opener for many of us who have mildly suspected that all this new technology has unforeseen consequences. We are too far along to turn back, but we can minimize the damage caused by the latest and greatest devices by remembering to take time in the real world. After all, there is more to life than could ever be depicted on a screen. Next articleCan You Be Easily Hypnotized? Take this awesome test and find out.